When I popped over to her blog to have a closer look I read that she was challenging us to emboss...Weeeell I am really not an embossing folder type of person I must admit, but I went to the basket were there resides quite a few unloved embossing folders! I then set about trying to emboss ...the darn things have a mind of there own! they emboss squint -nothing to do with me they went in straight! So then I thought that i would try the technique that Michele had wrote to me about ,tap a hammer on the embossing folder to emboss random parts,what could be easier??? Then I found this houndstooth one and it did start off squint but started big and kept diecutting it til it was straight...bored?? so was I by this time! Returned to the fray with renewed energy after a cuppa and diecut out the W9 happy twice so that it would have a shadow,same with the CBballoons .To add the strings I used a bit of silver Christmas ribbon.Popped it up on foam and dimensional tape ,stepped back and you know what ....I actually thought that little bit of embossing just set the card off nicely....so Michele you might just have converted me ! Thanks for taking the time to look !! I love how you were inspired...so fun! Fun! Love the black peeping out - it provides lots of definition! So glad you joined us at Muse this week! Nice!!! 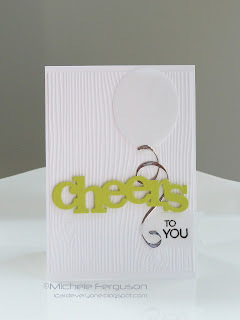 The houndstooth embossed background looks fab!